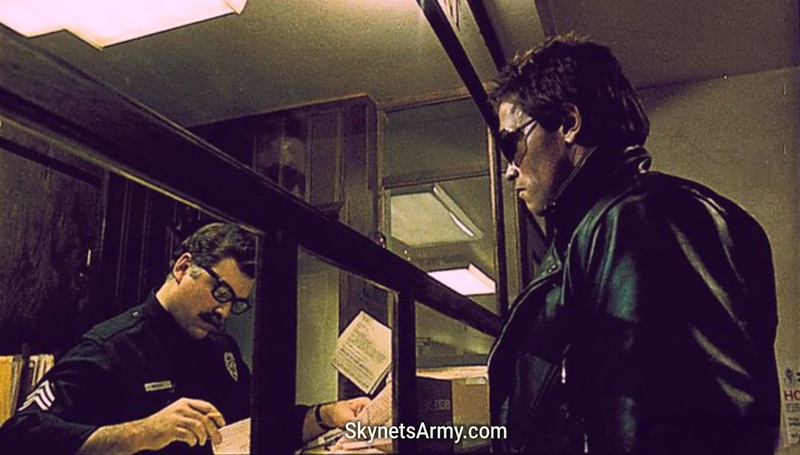 Did you know that in 1984’s The Terminator, when actor Arnold Schwarzenegger says the iconic line “I’ll be back” and then proceeds to crash his automobile into the West Highland Police Station, you can briefly see that the Desk Sergeant has been replaced with a dummy? 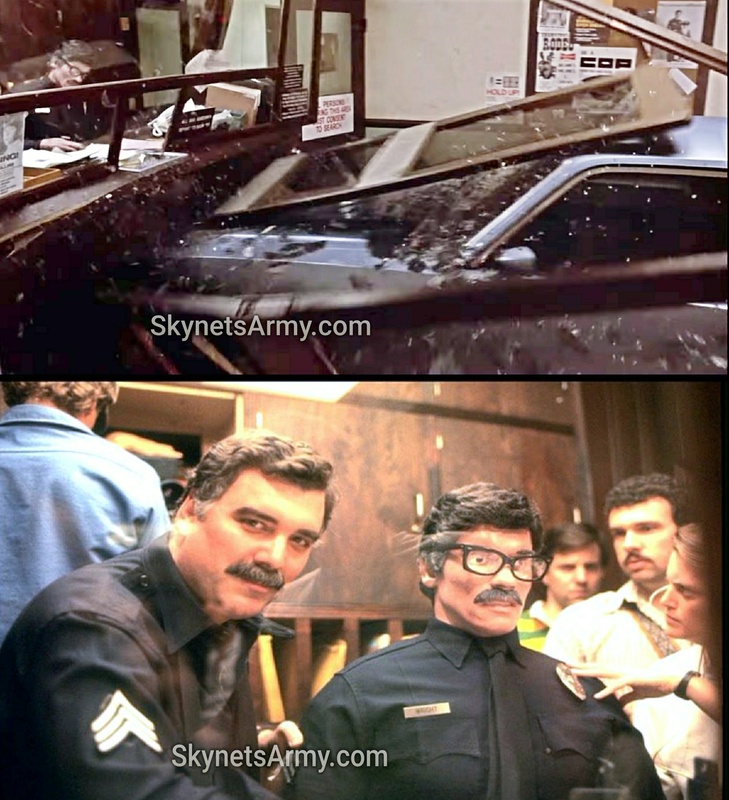 In a blink and you’ll miss it moment, the dummy was naturally put in place of the real Sergeant Wright actor Bruce Kerner, to prevent him from being exposed to any physical harm. It’s often believed that if writer and director James Cameron ever remasters this original science fiction classic (like he did with T2), he will likely digitally alter the stand-in dummy to make it appear more lifelike, to better match the actor it replaced. Did you know that in “Terminator 2: Judgment Day”, when the T-1000 smashes the T-800 Model 101’s head with a steel girder, instead of using a dummy head, James Cameron smashed a radio controlled, fully articulate Arnold Schwarzenegger robot head worth thousands and thousands of dollars? Originally, Stan Winston’s effects team built a flexible puppet head specifically made for this scene, designed to be bashed repeatedly with a steel girder (that was really made out of wood). 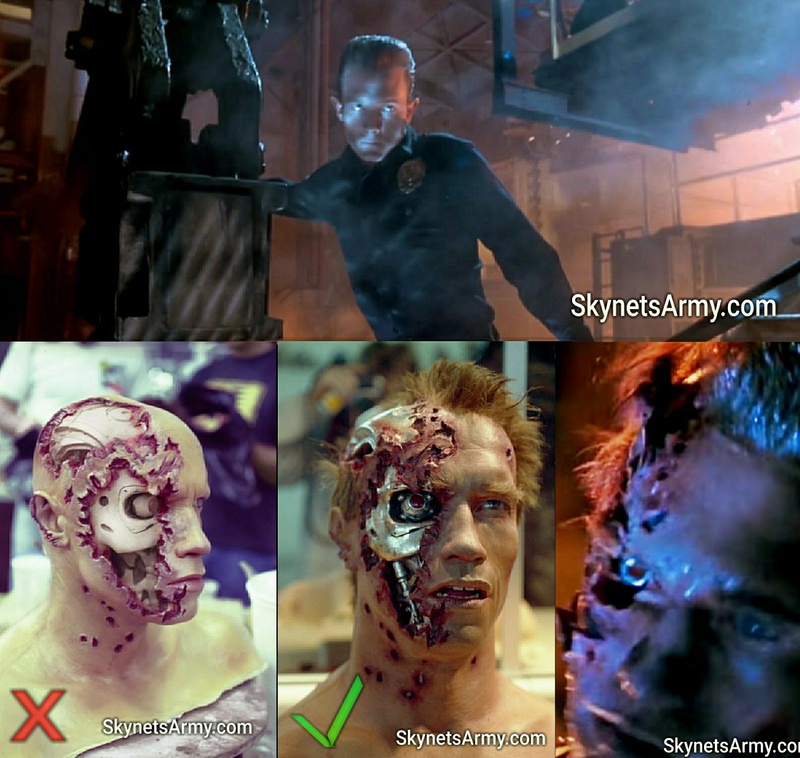 But when the scene was filmed, Cameron complained that audiences would be able to tell it’s a flexible rubber T-800 head and it was slightly caving in everytime it is bashed. Stan Winton had nothing else prepped, so the only solution they had was to take a fully designed, radio controlled, completely electronic, very expensive Arnold Schwarzenegger robotic head and let Jim bash that in. So they re-filmed the scene, James Cameron operated the wooden girder, smashed the extremely expensive head, and finally was satisfied with the results. A FIGHT FOR THE FUTURE! Did you know that director James Cameron and actor Arnold Schwarzenegger had a fight over a deleted scene from “Terminator 2: Judgment Day”? It came out during a Q&A Arnold Schwarzenegger gave at a “Terminator Genisys” fan screening in New York on June 24th 2015. 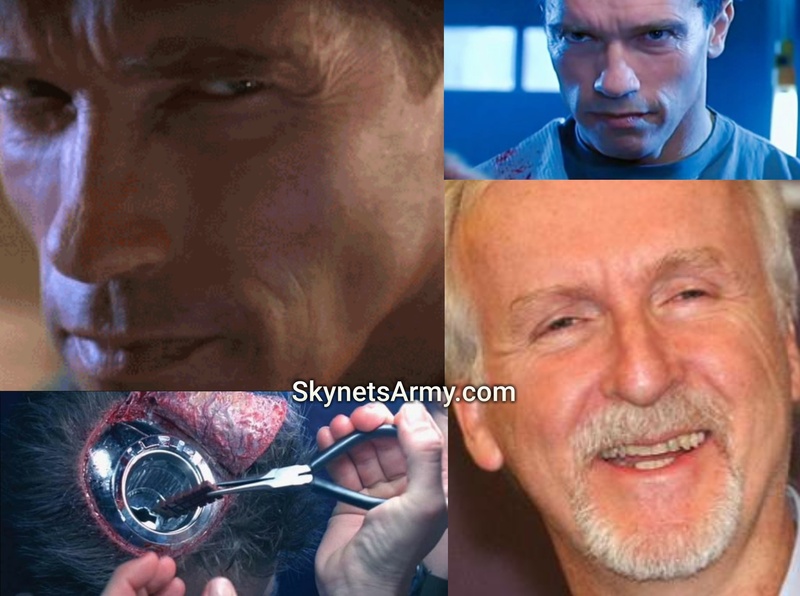 Asked about if there were any scenes cut from Genisys that he disagreed with, Arnold could only remember a fight he had with James Cameron over the chip removal scene from “Terminator 2”. According to Schwarzenegger, Cameron didn’t agree cuts were needed at first. But after some struggle, Cameron finally agreed and decided to cut Arnold’s favorite scene, the one where Sarah and John Connor remove the Terminator’s brain chip. Needless to say, Arnold wasn’t pleased. Though Arnold was upset to let the scene go, he finally relented, recognizing it was a necessary trim, especially considering cutting the movie’s length was his idea in the first place. We’ll be back… with Volume Eleven! And check out Volumes 1 through 9 by clicking HERE. Previous PostWhat ever happened to the “TERMINATOR 3000” animated 3D film?Next PostCould the upcoming “TERMINATOR 6” be entirely computer animated? The last one, while I also love that Scene. It not only was a needed cut to shorten the film. But it was also needed to not contradict the previous film. If the chips are always set to Read-Only when the Terminators are sent alone, the first T-800 from the first movie wouldn’t have been able to learn anything at all.